Recently rescued a Juno-106 in "critical condition" internally. (Full story below in post #6) The unit suffered a lot in the hands of previous owners and was obviously used as a component donor, although all the 80012As and D5534As weren't even touched or reconditioned. I acquired all the missing components and put them back into place. After a couple of months of work, the cosmetics were overhauled: panel board, keybed, case, rebuilt the bender assembly, all new pots and sliders, buttons. The usual, you know. While testing the power circuits, I've discovered the PSU board isn't checking out. I am not an electronics engineer, far from it, I just love synths. I kinda expected bad caps or a bad regulator, but I am literally ready to kill myself now, after a week of troubleshooting. Problems: No negative -15V at either TP1 or the regulator / TR1. I am getting 0.6V positive voltage instead. The +5V circuit done by the smaller M5231L is fine and outputs a precise 5.0V. The 7805 side is working too and test point D provides 5.01V while being a bit high on the +9V providing 11.7V. Something to look into? Test point C +15V gives 15.65V so I guess I'm good there. The transformer looks fine and outputs 16.4V and 9.4V AC on the BLK/RED and ORG/ORG windings respectively. At first, I am trying to tackle the -15V problem. 1. Changed the M5230L regulator for a new one. 2. Recapped the whole board apart from the 3300/35 big caps (no stock locally), I had a few used ones and did a swap. 3. Replaced TR2 transistor with a new 25SD1409A. 4. Reflowed the whole board just in case. 5. Tested diode D1, it's fine. 6. Replaced the D6 1B4B41 diode bridge with a used one. Then I kinda ran out of ideas and started throwing spare parts at the problem due to my sheer incompetence in the matter. Needless to say, nothing worked. I am stumped. Anyone with knowledge and experience can help a poor guy out? Thanks in advance for reading this through. Last edited by The LT on Wed Jan 09, 2019 12:37 am, edited 4 times in total. When the psu is disconnected from all the other boards is the -15V line missing ? The transfomer has 2 secondary windings, one should supply 9.5V and the other one 2 x 19V. The 2 X 19V winding is center tapped , so you should be getting 19V-0v-19V [red(3)-black(5)-red(4)]. Are you getting dual 19V lines ? If one is missing that should explain why the -15V line is down. Other than that, check fuse F3, bridge rectifier D6 ( <- my bet is on this), transistor TR1 and diode D1. Thanks for the suggestions! Yes, I am getting 16.6V on both RED/BLK/RED transformer windings. I know the notes say 19V but the transformer itself says 16V and my other working Juno-106 also measures 16.6V on them. What readings should I be getting from D6 bridge? Mine is giving 37.5V DC on the +- outputs. The board doesn't have fuses and I've already tried replacing TR1 with a 25SD1409A one. I am testing the PSU without any boards connected. Both transistors are cold to the touch. I am kinda out of ideas. Maybe I need to check the board for cracks. The voltage on the bridge rectifier does not look suspicious. Isolate the psu from the rest of the unit and power it up. Is the -15 voltage rail working ? Yekuku wrote: The voltage on the bridge rectifier does not look suspicious. I've already removed the board from the heatsink and it's sitting on a piece of wood with no white output leads connected. I've tested all the resistors on board and replaced a couple that were a bit off, they seem to check out okay. Still the same 0.65V positive on the -15V rail. I am starting to pull my hair out. Thanks for bearing with me. I have another "donor" power board which had a faulty regulator blow up the synth I am trying to fix. Maybe I should just refit all the components on it? It's not that pretty though. By the way, here is a story for anyone interested. I've recently got two Juno-106 from local classifieds. Both were sold as-is and surprisingly, both were quite okay cosmetically. No dents, no broken keys, no sticker labels. One was used as a voice-chip donor. No black resin coated chips at all. It seemed like the owner tried to restore it but then decided to sell it off. It had all the original faders, but obviously cleaned and lubed, all the tact switches replaced and it looked like the keybed was given a bath and a rework. It also lacked a transformer and a power socket. The condition was quite nice, overall so I went with it. (The price was about USD 380$). Another one was even nicer on the metal panel itself, although it had half of its faders missing its shafts (and caps, obviously). The faders were in a very bad condition, very grindy and dirty. Internal inspection showed a lot of missing generic components on all the boards and almost no replaced/new components. Not a single cap was replaced. It also showed signs of tampering with the boards and some "cut the trace, lift a leg" diagnostics being carried out by someone. The unit was lacking a mains fuse on the fuse board and torn mains wires. It looked bad. Upon arriving home, I've discovered that the first unit had a broken bender assembly which was sloppily fixed by some foam linings. I wiggled it a few times and it came off. The bender pot itself was quite grindy and obviously resoldered as it had heatshrinked leads. I've decided to start by trying to revive the first unit. I took the transformer out of the second unit and put it into the first one, checked the power board voltages and they were almost within specs. Adjusted VR1/VR2 and got +5/-15V going. Then I decided to try and revive the chips from the second unit. The vca and dco chips on the unit were removed, acetone bathed and turned out to be in very poor condition. I've removed the SMD chips, did a thorough clean and resoldered them back in only to discover most BA226 chips dead. Also, 2 out of 3 DCO chips were bad too and I couldn't fix those. Out of 6 voice chips I've managed to salvage 3 along with one DCO. I've socketed the module board and put the chips in. The synth came back to life, but patch memory was busted. The battery was replaced (dead for some reason) and a quick swap of TC40H000P did the trick. Loaded the factory patches in and now I have an almost working synth awaiting a replacement set of chips. I also swapped the bender assembly and pot from the second unit to it and the bender came back to life. Took me some time to fit it right though. Ordered a replacement bender part and pot from Syntaur and will rebuild the second one when the time comes. Then I started to work on the second unit. It was totally dismantled and given a bath. Every key has been removed and cleaned. The rubber bushings were removed, cleaned with isopropyl alcohol and carefully put back together. The panel board was overhauled with a new set of 16 new aftermarket faders and new tact switches and given a total joint reflow. Then came the hard part. Closer inspection has shown that the unit was badly vivisected upon. A LOT of components were missing from every board. From what I could gather, the unit suffered a power malfunction as even the fuse board had a large blue ceramic cap torn from it and the mains fuse was nowhere to be found. The power board check showed a faulty regulator, but that was the least of my worries. The previous owner supposedly proceeded to "diagnose" the unit after a regulator fault by cutting traces, lifting CPU legs and tearing out ceramic capacitors on both the module and CPU boards. He even ripped out the blue ceramic resonators for some reason. Even the jack board is missing a few green capacitors and a couple of film (?) caps near the chorus circuit which I am still trying to figure out where to get. I went with ordering what I could. Got a new CPU, a ton of ceramic caps, sockets and other parts and started populating stuff in. I also had to get a new transformer so I grabbed a set of transformer/fuse board/power board off Reverb. Turned out the new Power Board had problems on its own, unfortunately. The original power board had been messed with. Cut traces near the regulator, lifted traces near the transistors. You know. Ugly stuff. The CPU board, while it looked very ugly at first, I've managed to fix by refitting all the ceramic caps back in, a couple of electrolytic ones, putting in a new ceramic resonator and installing a new NEC CPU to replace the 7811 mask ROM one. Socketed it in. Had to remove the resistor at J1 put a jumper on J2 to switch to external. Fitted a socket and put a 2764 EPROM with flashed binary in and boom, the thing works. I grabbed both NEC D7811G (with non-juno mask ROM for cheap) and D7810Gs for good measure. Both worked without any problems. I still need to replace TC40H000P because I had to fit it to my other unit which is almost restored and required it for patch memory to work. Put a new battery holder in. The unit still had its seemingly original panasonic cell which still had 2.45V in it. The yellow band was as discolored as the ones I replaced in my Junos when I was a high school kid in the late 90s. But the CPU board works as tested in the first unit. Yay! The struggle continues. I am sure I will have a lot of fun with the module board and the jack board. The module board was one big mess with almost EVERY ceramic cap RIPPED out. WHY? (Had to desolder and remove the leg remains). It also had both ceramic resonators cut out for some bizarre reason. I am putting money on the slave CPU being deader-than-dead too. It also has wrong value/casing type resistors hastily fitted near the voice chips for some reason. One of the "repairs" the guy did to his Juno. I would punch him but the seller said "I have no clue about what this synth is and what it does, sorry. AS IS!". Oh well. That's the story so far. Need to tackle that damn PSU to move on. Some photos under the spoiler for those interested. Unit 1 in the foreground, Unit 2 undergoing cleaning in the back. Unit 2 cleaning in progress. Some gnarly boards from Unit 2. Note the missing components. Replaced the ceramic resonators. Notice the solder blob left by the previous "tech". That was a cut trace. A patched-up Unit 1 near it's bigger brother, which is a whole different story in itself. It's fixed and taken care of though. I enjoyed reading your story while drinking my morning coffee, good luck with the repair man, you are certainly going to need it ! Ok by isolating the PSU , now we know that the problem is in the PSU , it would not be hard to tackle it. Edit: Are you sure that the 2SD1409A is compatible with the 2SD1406 ? I am not an expert in transistors , but by looking at the datasheets , I have doubts that it can be used as a drop in replacement. Thanks Yekuku! Hmmm, we are on to something. Pin 4 reads 0.55V and Pin 2 reads 8.09V. EDIT: Found it. It was a small crack in the board between D6 negative and TR1. Concerning the 2SD1409A , I have a few doubts that it can be used as a drop in replacement to the 2SD1406, you should double check this. Let us know how it goes, good luck man ! All thanks to you, Yekuku! You're the man! Thank you so much! Yes, I've removed the 2SD1409A and put the 1406 back in. Checked the datasheet and indeed it was rated much higher, it was the closest I had though with a similar name, heh. My bad, I know, should have checked the datasheets first. Meanwhile, the fun continues. The unit now powers on and the front panel controls work, MIDI works, which means the CPU board is operational now. But once I connect the module board top connector (near C88 and the Slave CPU), it just lights up the key transpose/poly1/poly2 lights and won't boot. It seems the module board has a short somewhere, but I lack the skill and experience to diagnose and troubleshoot such a case. Requesting assistance! All of the voice chips are removed from the module board and the board itself cleaned with isopropyl alcohol. I've put in all the missing components and did my best to check, resolder and restore all the cut traces, of which there are quite a few. (4 or 5). I've inspected the board for obvious solder-shorts but I don't see any. Those cut traces seem to be the efforts by the previous owner to troubleshoot the problem. As the master CPU is dead, maybe I should try desoldering the slave CPU and replacing it? I have the spare and a 737 flip-flop for IC39 required for it. Or should I somehow troubleshoot the short first? Yekuku, any suggestions? Heh, if we get through this I owe you a dinner with drinks of your choice. Please note that I am no expert synth technician, I am a synth lover just like you that enjoys fixing his gear. With so much going on with this synth , it is really hard to pinpoint the cause of the problem. DO NOT replace the slave CPU until you are 100% sure that there are no problems with the voltages on the module board. By looking at the schematics , I assume that the synth hangs when you connect connector [30....23]. (Service manual page 12, upper connector). Please confirm this. This is the connector that carries the operating voltages and ground for the module board. ( 5V, 15V, -15V , digital and analog ground). Try sth first , power up the synth with this connector connected , and quickly check the operating voltages on the power supply. Are all power lines ok or not ? ( 15v,-15v, 5v) . If not then sth broken in the module board is taking the voltage(s) down, thus the synth does not start. Do this quickly but safely , because if a power line is shorted to ground , it could affect other things. Yes, I can confirm it seems to be the power bus connector 30-23 that is the problem. I will check the voltage drop on the PSU when I get to the workshop. I replaced a lot of decoupling ceramic capacitors which go along the top long traces. They were cut out of the board. Makes me think the guy tried to troubleshoot the problem by brute force. Last edited by The LT on Thu Jan 10, 2019 3:03 pm, edited 1 time in total. The decoupling caps are connected to powerlines and ground , this makes me think that the previous owner had a power line shorted to ground and he suspected a shorted decoupling cap , thats why he cut them , I cant think of any other reason. From my experience , it is rare for a ceramic decoupling cap to short , unless there is a major malfunction. Anyways , before powering up and trying what I suggested in the previous message, read the resistance between 5v, 15v , -15V and ground on the module board , do you get any low resistance/short readings anywhere ? You can do this on the connector, having the module board disconnected from all the other boards. Also some high resolution pics of the module board could help figuring out what the previous owner was up to. Were the pcb cuts and the cut caps only on the module board ? Edit : I found out that a bad voice chip can be responsible for short to ground on the module board. When you connected the connector did you had the voice chips installed or not ? If they were installed , remove them , power it on and check if it hangs or not. 2nd Edit : Please explain why you said that the psu does not have fuses. I am asking because in the pics that you posted I see fuses. Do not power on the synth until you have proper fuses installed. 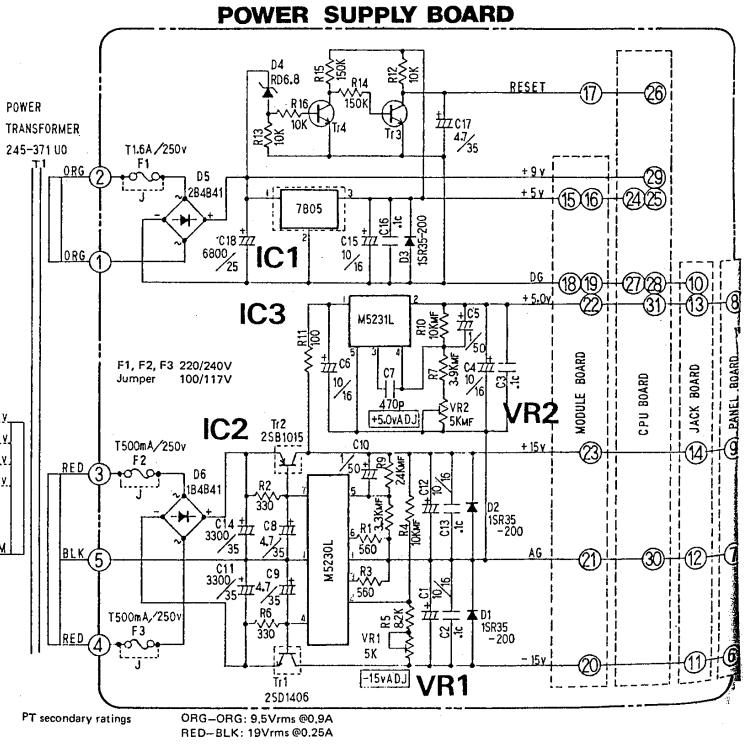 Okay, about the fuses, I believe there were 2 (or 3) revisions of power boards. The 220/240V version of the Juno-106 had a power board with F1, F2 and F3 populated by fuse holders while the 100/110V version had jumpers over the F1/F2/F3 pads.